It’s at this time of the year – and before – that thoughts turn to Christmas. Wrapping paper, Christmas baubles, will I need the sledge? Are my heels too high to dance in? There is, of course, the desire to have a little fun. Creative fun maybe. 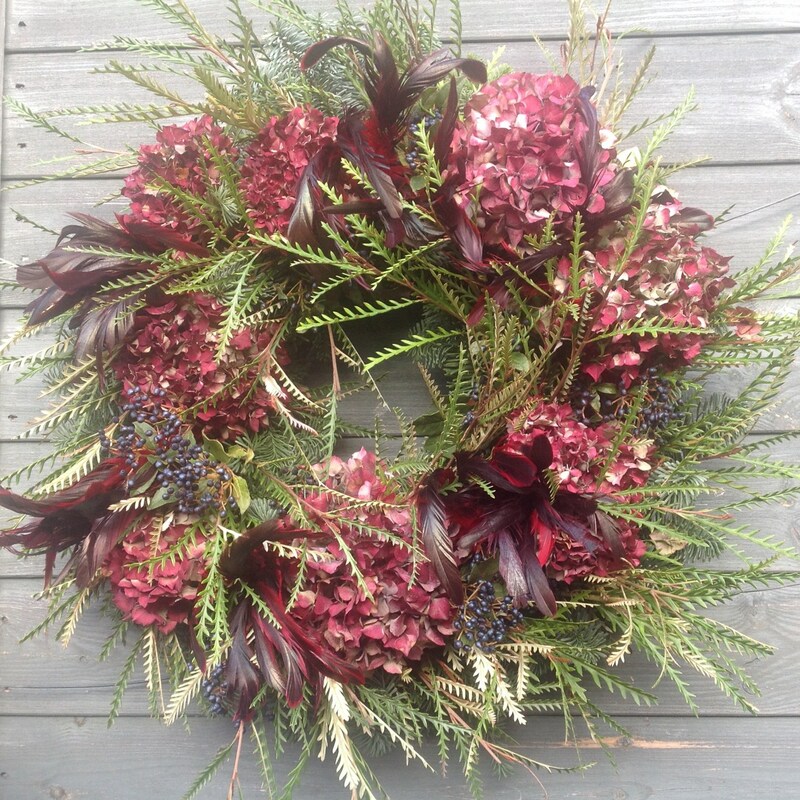 Here at The Velvet Daisy we run Festive Wreath Making Workshops and Festive Table Flower Workshops. We aid that inner creativity to shine through whilst enjoying the company of friends, partners or/and making new friends. By embracing the beauty of the festive season, you can join one of our popular workshops by designing and making your own fragrant and natural wreath, ready to adorn your home. You may also like to express your inner skills by coming along to a Festive Table Flower workshop another way to create the seasonal outdoor coming indoor winter scents. During the very relaxed workshops, under tuition, you will be shown how to create a traditional moss-based wreath, using a plentiful supply of fabulous seasonal foliage, berries and fruits. A selection of festive sparkle delights will also be available to add to your design if you wish. The price includes all materials, bubbles and a steady supply of seasonal refreshments. There are such a variety of workshops (including ours of course) to choose from around the country, it can make the decision overwhelming enough to reach for the strong tea or mulled wine. The purpose of all these workshops are not only to create a beautifully scented wreath to adorn your door or garland to delight the mantlepiece, but to enjoy. Going shopping at Christmas time, battling to the Christmas department for decorations, is not quite as relaxing and sociable as a room filled with an abundance of fresh foliage and imaginative accessories. How would you choose the best workshop for you? – Where will The Velvet Daisy be?! Other considerations may include being loyal to the person holding the workshop; if going along with friends, which would be central for all; it may also be something to consider, which workshops provide the best refreshments. Small and simple: Adding a few seasonal decorations to a fresh pre-made wreath or creating a small wreath from branches and twigs and adding a little seasonal foliage. Larger and simple: A larger pre-made wreath with a bigger selection of fresh seasonal delights and/or artificial decorations. All fresh foliage, twigs and berries to create a very natural design. seasonal foliage and garden wonders, then finishing with a host of seasonal delights including shiny bits to make it a little more bespoke. Workshops are great for social interaction. Be it for single people, couples, partners, girlfriends, boyfriends, clubs, schools, thank you for…, corporate bonding; whatever suits. The final consideration, normally included in the price of the workshop, what will be the delicious festive refreshments? Coffee, decaffeinated coffee, tea, herbal tea, water still and/or fizzy, water with cordials, wine, mulled wine or bubbles. Along of course with platters of seasonable edibles. The workshops always fill quickly but occasionally further dates are added. These workshops are currently held in London. However, if you’d like one elsewhere then do contact me. So, enjoy the creative festivities and have something to smile at each time you walk through the front door, look at the garland decorating any room. Wherever you choose to go and whatever you choose to make, relax and surprise yourself.